I seem to have taken a long hiatus from blogging, and the start of the school year, always a time of fresh beginnings for me, seems like the right time to start back up. Earlier this summer I went with a friend to see the Ave Maria Grotto, in Cullman, Alabama. I’ve been meaning to visit it for, oh, twenty-five years or so. As mentioned above, I can be slow to get to things. It was a very hot day, but the shaded hillside on which the structures—sculptures, replicas of famous buildings, and the grotto itself—are scattered was comfortable enough for wandering around. As most people in Alabama know, Ave Maria was the work of Brother Joseph Zoetl, a Benedictine monk who was originally from Bavaria. 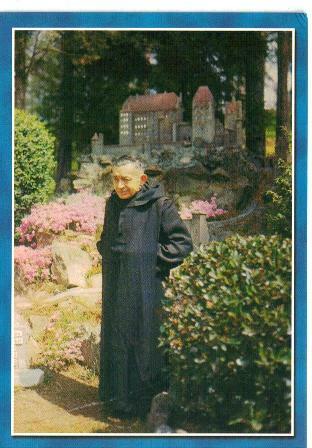 According to the Ave Maria Grotto website, he came to St. Bernard Abbey in 1892 at the age of only 14 and began building the main Ave Maria Grotto in 1932, dying in 1961. Walking around the grounds, seeing replicas of the Pantheon and the Colosseum, the Temple in Jerusalem and the Gate of Herod, the Statue of Liberty and the Alamo, the Temple of the Fairies and Hansel and Gretel, I pondered the fecund creativity of this elf-like man. The Abbey is a place of religious practice but of course the Grotto is a work of art as well, a rambling, in situ installation that astonishes with its variety and craftsmanship. I imagine Brother Joseph in his off hours, finished with whatever his assigned work was at the time, becoming wholly absorbed in considering what to use for an arch, how to incorporate a donated bag of costume jewelry. Hours passed in an instant and suddenly the bell was ringing for compline. Hands roughened, shoulders aching, he stepped back into the orderly world of time-keeping, having swum for a while in the stream of the ongoing process of creation. That sometimes happens to me when I’m writing, that utterly focused in the moment yet out of time feeling. Like Brother Zoetl, I’ve also found pleasure in putting fragments together to make art, in my case mini shadow boxes. I make them occasionally, when the mood hits, out of collected scraps of images, cloth, Chinese fortunes, shells, stickers, sequins. It feels like play, concentrating intently on color, shape, and balance, mixing the verbal and the visual. I think of them as tiny, portable altars, made in moments of sacred play.